we are providing the quality water tank waterproofing services in Hyderabad we give quality Waterproofing Treatment for Water Tank. we are one of the best water tank waterproofing company in Hyderabad. If any body need water tank waterproofing in Hyderabad call us on : 9700191890. The recent construction and property boom have reworked the cityscape of water tank Waterproofing Hyderabad. The skyline of our town is quickly changing so area unit its service wants. The standard approach to service delivery of water tank waterproofing service is not any longer comfortable to cater to those new and quickly changing service demands. At Dhanasree Waterproofing we tend to recognize this transformation and have diligently structured our organization too with efficiency and systematically meet these new service demands within the area of water tank waterproofing Services in Hyderabad. The water storage tankers within the residential or industrial or company areas become broken attributable to the persistent water storage. This injury can produce little cracks or perhaps minute holes that result in excess water leakage. These leakages surround overall tank from floor to roof. Eventually,it enters into the walls and concrete of the tanks. Hence, waterproofing treatment for the storage tank is critical to stay the tank in correct condition for an extended time. The internal and external water tanks leakages area unit quite common in any building. The water tank waterproofing services area unit in dire straits each roof and floor otherwise. 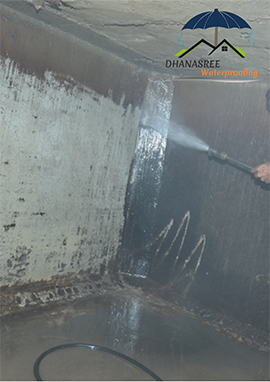 To contact us: +91 9700191890 we at Dhanasree Waterproofing services give you the commercial best waterproofing treatment for theWater tank. We have a tendency to use the simplest chemicals and waterproofing procedure from the business with our experienced team to finish up the work among the calculable time and guarantee to create the water tanks outflow free with 2 years of assurance from the day of labor finished.